The trial of 12 Catalan pro-independence leaders involved in a bid to secede from Spain that plunged the country into crisis starts on Tuesday under intense scrutiny and controversy. It is divisive – a ‘farce’ according to independence supporters in Catalonia – but necessary for many Spaniards who looked on in disbelief as the region’s then executive tried to break from the country in October 2017. Carles Puigdemont, Catalonia’s former president who moved to Belgium days after a short-lived declaration of independence on 27 October, is not among the 12 defendants. Spain does not try suspects in absentia for major offences. The trial’s main protagonist is therefore former regional vice president Oriol Junqueras, who opted to remain in Spain. He faces up to 25 years in jail on charges of rebellion and misuse of public funds. Others in the dock include members of Catalonia’s then executive or regional parliament as well as the two leaders of powerful pro-independence associations, the Catalan National Assembly (ANC) and Omnium Cultural. Their role in holding a banned independence referendum on 1 October 2017, which was marred by police violence, and in the subsequent independence declaration will be closely scrutinised. Former prime minister Mariano Rajoy has even been called to testify. Under Spanish law, rebellion is defined as ‘rising up in a violent and public manner’. The independence movement provided for ‘the use of all necessary means to reach its aim including … the necessary violence to ensure the sought-for criminal result,’ public prosecutors argue in a court document. 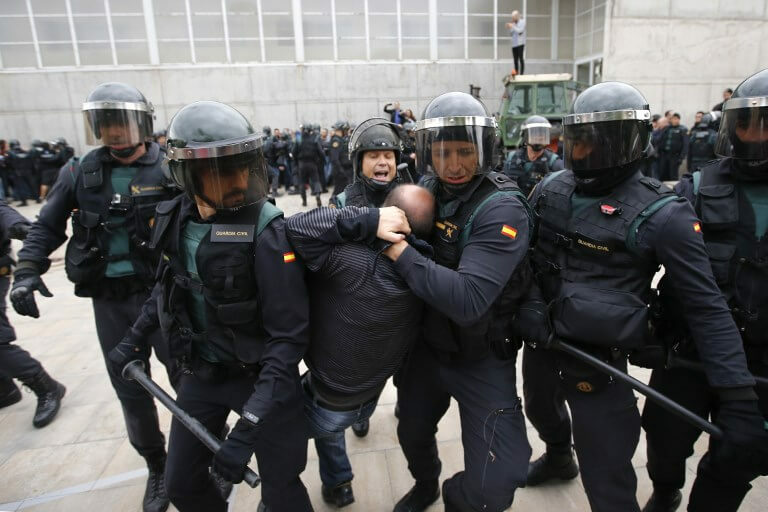 The defendants ‘called on citizens to participate in the 1 October referendum knowing it was illegal and that explosions of violence could therefore take place,’ they add. The Spanish government through its lawyer in the trial is accusing the pro-independence leaders of the lesser charge of sedition, which fetches up to 12 years in jail. Catalonia’s independence movement hopes to turn the trial into a global political soapbox. ‘We will stand before a popular jury – the entire world – which we will have to convince,’ said Alex Sola, the lawyer of Omnium Cultural president Jordi Cuixart, one of the defendants. Independence supporters are planning protests in Catalonia, Madrid and in other parts of Europe. Beyond the courtroom, the trial will also have an impact on Spain’s political scene, says Antonio Barroso, deputy research director at the Teneo Intelligence analysis group. ‘The Catalan issue is at the heart of debate in Spanish politics and this trial, by recalling what happened in 2017, will be used by the right to criticise any (government) negotiation with the separatists,’ he says. Socialist Prime Minister Pedro Sánchez, who came to power in June after ousting Rajoy, needs the votes of separatist national lawmakers to pass his 2019 budget and stay in power. Far-right party Vox, meanwhile, is taking part in the trial as the so-called ‘popular prosecution’, a Spain-specific legal mechanism that allows any citizen or organisation to make their accusations.